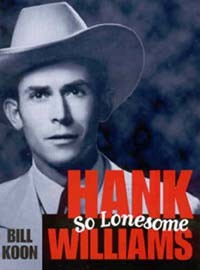 Hank Williams (1923--1953) is revered in the top tier of the country-music pantheon, and his forlorn ballads are classics in the country songbook. An inspired, natural genius, Williams was the complete country balladeer. Though he knew almost nothing about the technicalities of music, his plaintive songs—"Cold, Cold Heart," "Your Cheatin' Heart," and "I'm So Lonesome I Could Cry"—affirm that he knew everything about its heart.